US 2012-01-11 $9.99 ×2 ? UK 2012-01-11 £7.99 ×2 ? EU 2012-01-11 €8.99 ×2 ? JP 2012-01-11 ¥1,500 ×2 ? US 2012-01-11 $9.49 ×2 ? EU 2012-01-11 €9.99 ×2 ? 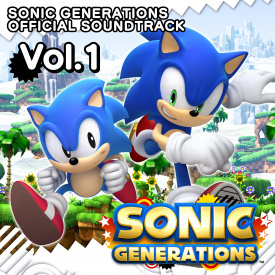 Sonic Generations Official Soundtrack is a two-volume digital album containing music from Sonic Generations, released in January 2012 on iTunes and Amazon. The corresponding physical version of the soundtrack, Sonic Generations Original Soundtrack: Blue Blur, features 90 songs, while the digital version available only has two-thirds of that total. Among the missing tracks are both credit medleys, the cut scene music, assorted jingles, and the "White Space Medley" that plays in the main hub of the game. This page was last edited on 8 February 2019, at 20:19.